This past Saturday, April 6th, We Rock the Spectrum – Williamsburg hosted a Meet the New Owner celebration to welcome Kimberly Moore to the WRTS family. Kimberly is an autism mother born and raised in Williamsburg, VA. Prior to owning the We Rock gym, she managed two local hotels. Her son, Aiden, was diagnosed with ASD when he was 4 years old. We Rock the Spectrum has provided a comfortable and safe space for her son to discover, learn and play. Kimberly and her team showed the community just how committed they are to providing a safe and fun place for ALL children. 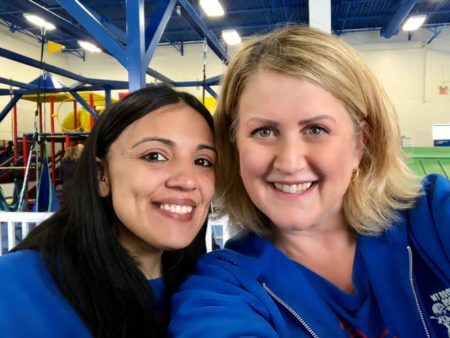 Not only did they show off their awesome space and their ROCKIN’ sensory-safe equipment, but they also provided face painting and arts & crafts. The James City County Police also stopped by to join in the fun. They made child I.D.’s for our We Rockers and supported the gym by handing out Autism Awareness stickers. Congratulations to Kimberly, Aiden, and their ROCKIN’ team on a successful celebration day. We are so excited to have them join the We Rock the Spectrum family and look forward to all of the amazing things that they will do for the Williamsburg community. 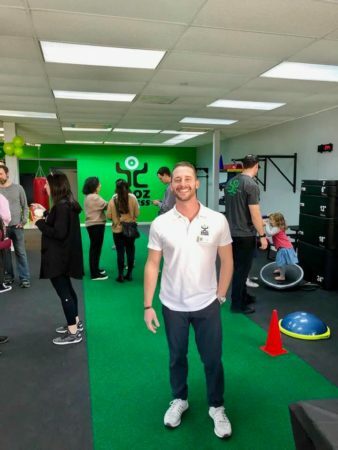 This entry was posted in Gym Owners on April 11, 2019 by David TEST! Ephraim. 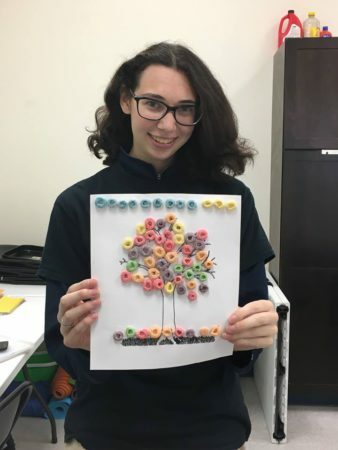 This entry was posted in Autism Resources, Events on March 19, 2019 by David TEST! Ephraim. We Rock the Spectrum – Let’s ROCK Australia! Sally and her brother, Marcus, will be working hands-on with all of these upcoming gyms. Let’s introduce you to our new locations and the awesome new gym owners that will be joining the family! Wollongong, often referred to informally as “The Gong”, is a beautiful coastal town in New South Wales. It lies on a narrow strip of land between the Illawarra Escarpment and the Pacific Ocean. It is a gorgeous beach destination with plenty of good eats and beautiful scenery. It is the third largest city in New South Wales, and the tenth largest in Australia. 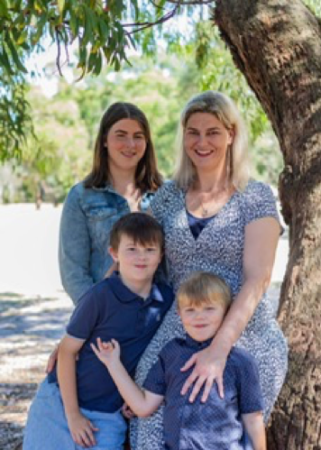 Hellen and Shane Walton will be the new owners of We Rock the Spectrum – Wollongong NSW. They are parents to an awesome 6 year old, Ethan. When Ethan was 2 years old, he was diagnosed with level 2 ASD and GDD. They made the conscious decision to dedicate their lives to Ethan’s ongoing development and prosperity. Their combined experience in the Finance and Project Management fields has prepared them for property development, event management, aged care, and retail. They are excited to promote love, acceptance and inclusion in the community. Hellen and Shane are going to ROCK as owners at this beautiful location! The Western region of Sydney is our next destination on the map. Sydney, Australia is the largest city in the capital of New South Wales and is the most populous city in Australia. It is divided into multiple regions. Sydney West is considered to be one of the most crucial political regions and is home to many sports team. There’s lots going on here and we are ready to be a part of it! 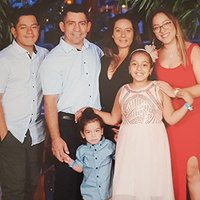 Maritza and Luis Aguirre will be taking on the exciting mission of bringing We Rock the Spectrum to the Sydney West community. Their daughter was diagnosed with Autism and they have been searching for a place where she feels like she belongs. We Rock the Spectrum provided that space. They are excited to give other families and their children a place to call their own. We Rock the Spectrum – Sydney West NSW is already off to a fantastic start. Just below New South Wales in the state of Victoria is our next gym location in Geelong. It is the second largest city in the state and southwest of the state capital, Melbourne. It is often referred to as the “Gateway City” because of its central location in the Victorian region. It’s growing reputation as a health and education hub will be an awesome environment for We Rock to make an impact! 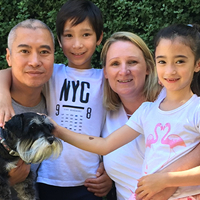 Danni and Minh Gazzara are the amazing couple that are enthusiastic and ready to take on this project. They are the proud parents of 3 kids: Caitlin, Pax, and Coco. Their son, Pax, was diagnosed with Autism at the age of 5. His difficulties in play sensory problems and social skills were recognized early in his life by his day care educators. 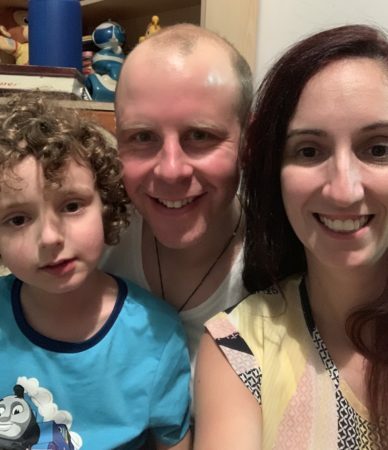 They took it upon themselves to learn as much as they could about their son’s Autism by attending information sessions, therapy classes, sensory programs, and consulting other parents. When they were introduced to We Rock the Spectrum, they knew that it would be a rewarding project for their family and to offer to the community. They are excited to offer a space for families to come for play, relaxation, fun, and sense of belonging. Just down the road in the state of Victoria is our next stop, Moorabbin. Moorabbin is a suburban community that is south-east of the capital of Melbourne. It is a residential and industrial region. We are in the very early stages of development for this gym but the responses have been overwhelming! The families of Moorabbin are excited to have the We Rock gym in their community. Rebecca Mercuri and Lisa Thomasson are already powerhouse owners! They are both kind, welcoming, and understanding mums who want to meet the needs of the children and their families in their community. 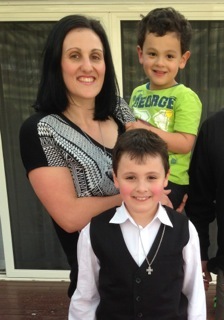 Rebecca has been in secondary teaching for 17 years and has two sons. Her youngest has Fragile X Syndrome. Since his diagnosis, she has dedicated her time to his care. She has a strong passion for true integration. Lisa has a large blended family with 5 children, all of whom are on the spectrum. She has 20 years nursing experience and is passionate about meeting Autism needs into a career. Rebecca and Lisa met when their sons were 2 years old and entering into occasional care. Over the past 6 years they have built a friendship based on coffee, Lisa’s “bad” cooking, tears, laughter, more tears, early intervention, therapy, and supporting each other. They are excited to bring a very much needed inclusive play space to Moorabbin. 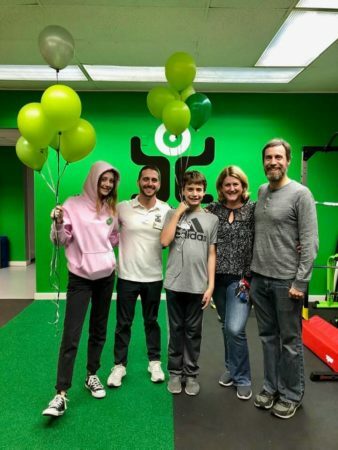 Congratulations to Dina, Sally and Marcus, and all of our new gym owners! We can’t wait for the We Rock family to keep growing all around the world. This entry was posted in News on March 15, 2019 by David TEST! Ephraim. 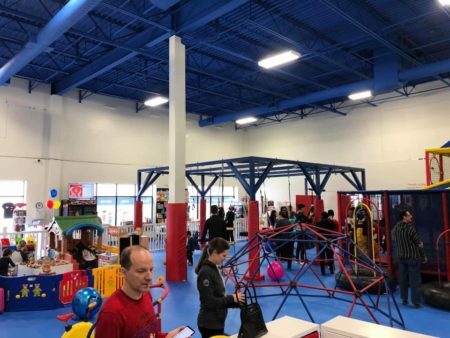 On Saturday, March 2nd, 2019, We Rock the Spectrum celebrated the grand opening of our first Canadian gym, We Rock the Spectrum – Oakville! Our CEO & Founder, Dina Kimmel, flew in for the big event. Tatiana and Boris Korosec are the amazing new owners of this newest location. They are parents to two awesome boys, Maxim & Aleks. Both boys are diagnosed on the Spectrum. 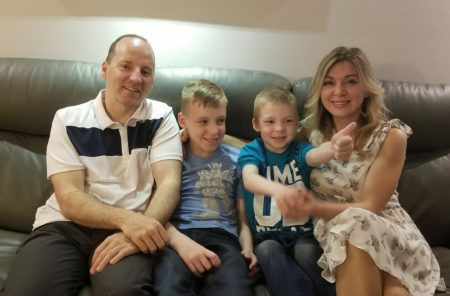 Tatiana and Boris have made it a priority to spread awareness and to support other Autism parents. They heard about all the great work that We Rock was doing in America and knew they HAD to bring the franchise to Canada! Dina Kimmel and Grace Covino made the trip to Canada from our Corporate office two days prior to opening. Their guidance and help with setting up the gym was invaluable! This gym is the biggest We Rock gym in square footage so far. Dina gave it the prize of “most ready to open its doors”! The day was a success with local businesses and vendors providing entertainment and resources for the Oakville community. There was an amazing turn out for the event. With the Korosec’s in charge and Dina there to represent, Oakville really experienced the full effect of the We Rock way! “We want to help as many kids as possible play and develop in a safe and comfortable environment,” says Tatiana. And she has done just that by providing this wonderful space for children and families of ALL abilities! Congratulations to the Korosec family on a ROCKIN’ grand opening! This entry was posted in Gym Owners on March 14, 2019 by David TEST! Ephraim. There are countless benefits to getting involved in sports at a young age. Kids learn invaluable skills like coordination, communication problem-solving, and encourages a healthy lifestyle! However, we understand that these skills may not come as easily to children who are on the spectrum. The core features of ASD effect social, communicative, coordinative and behavioral skills, which are heavily relied on for many team sports. Learning to swim is an extremely valuable skill for all children to know and translates into a great team sport as well. It is considered a very therapeutic activity and teaches kids the repetitive motions of different strokes and how to stay afloat. 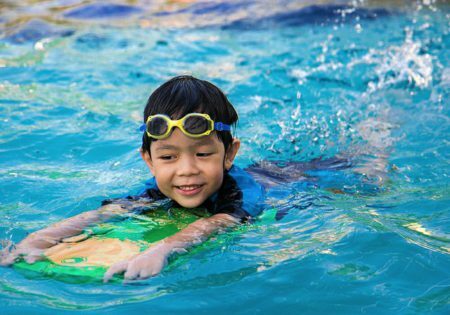 Becoming part of a swim team may seem like a frightening endeavor at first, but this sport allows children to compete on their own terms and improve at their own pace. Swimming has been known to improve coordination, social skills, self-esteem, and cognitive skills that they can use for the rest of their lives. Read more about other personal experiences and programs available here! Similar to being part of a swim team, track & field teams give kids the choice to socialize with teammates if they would like to, but it is not necessary to succeed. Accomplishments are made at an individual level. There is always the option to participate in relay teams where athletes can work together towards a common goal. Running is one of the best full body workouts and is especially helpful in combating diabetes and obesity, common concerns for those diagnosed with autism. 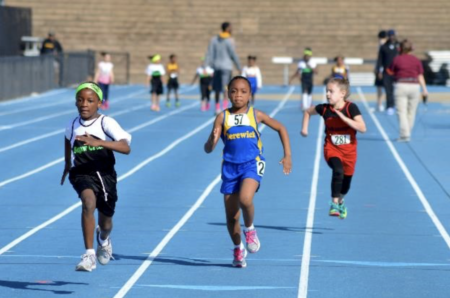 Some of the most important long-term benefits that track & field will provide for your child are a decrease in self-stimulatory behavior, decrease in aggression, and an outlet to burn off any built up tension and energy. 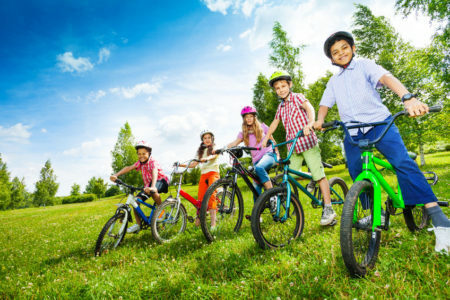 For children of all levels and abilities, learning to ride a bike is a great way to learn balance, independence, and stamina. 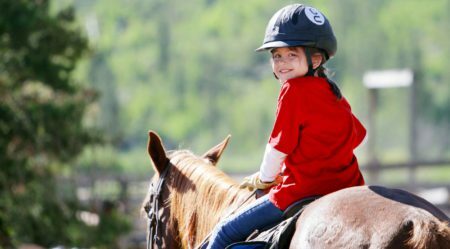 While the stresses of learning to ride can be especially heightened for children on the spectrum, there are plenty of resources that have great tips and ideas on how to make it a little easier. Check out howtolearn.com’s suggestions! Once your child learns to balance and ride on their own, cycling provides many awesome physical and mental benefits! The necessity for constant motion strengthens leg and core muscles, fine-tune’s motor skills, and teaches balance. Additionally, kids will learn the value of determination and how to succeed on their own. For kids that are not quite ready to commit to a team sport but may eventually want to, bowling is a sport that will ease them into an athletic social setting! It is an easy sport to teach and learn. The repetitive action of rolling the ball down the lane and watching the pins fall is often a very rewarding result and kids enjoy the celebration when they get their first strike! Kids will learn the importance of patience, as they are required to wait for others to go before they can have their turn. 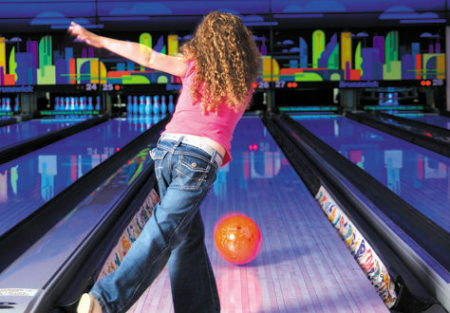 Bowling is known to improve social, coordination, and behavioral skills. Since the bowling alley is normally a loud environment, parents do not have to worry as much about their own child’s noise levels. However, the noise and light levels may be a challenge for some children. 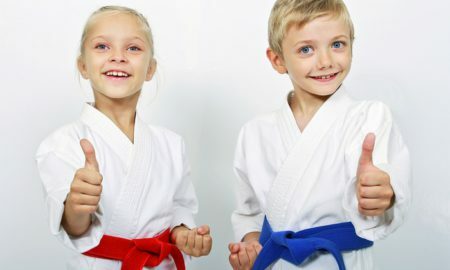 Martial Arts is one of the most highly recommended sports for children with ASD. The repetition and movements required to learn it are a great way to keep children healthy in both body and mind. The mental drills that are taught combat stress and anxiety and a calm demeanor is often encouraged during sessions. Kids are taught the value of structure and discipline. While this sport does put children in contact with others, it begins with one-on-one training by a professional until they reach an advanced level. By putting them in competition with themselves to remember the right movements and hit the right spots, they are developing invaluable mental and physical skills. Though this sport tends to be on the pricier side, horseback riding is considered to be extremely therapeutic. Even those with high-functioning autism have been known to excel at this activity. Horses and their handlers, who are specifically trained for this type of sport, calm riders, encourage them to focus on every moment and movement, and to accept the training process. Additionally, children learn how to care for the horse and develop connections with the animals. 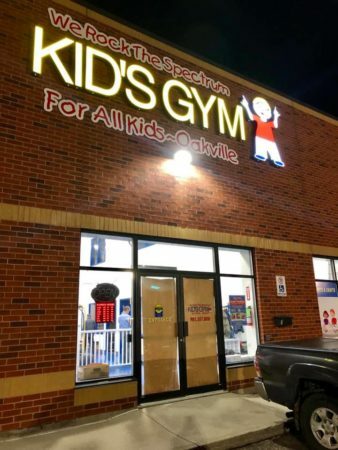 The We Rock the Spectrum Kid’s Gym is also here to help kids of all levels and all abilities stay active! 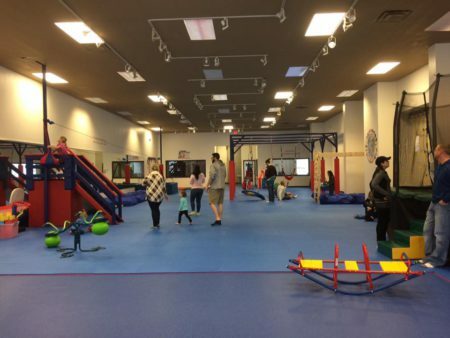 Our specially designed sensory equipment encourages many valuable life skills, such as motor control, upper and lower body strength, and socialization. 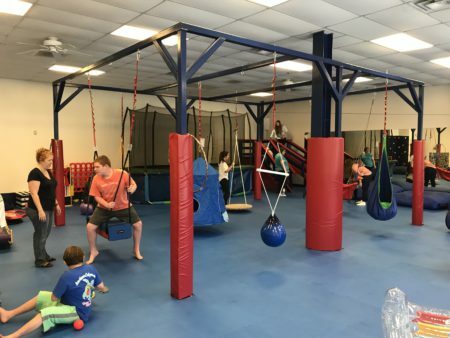 There are 10 pieces of specially designed sensory equipment at our gyms: the zip line, zip box and slide, crash pit, trampoline, tunnel, carpet swing, hammock swing, climbing structure, bolster swing, and swivel rotators and carabiners with webbing. 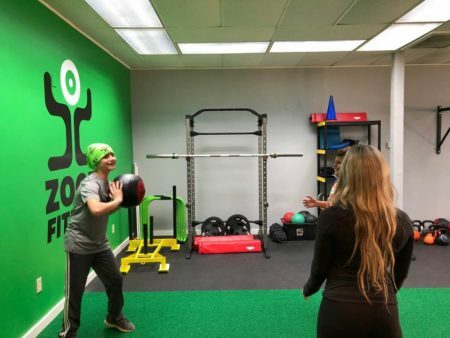 In addition to these, many gyms include rock walls and various fun activities to create a healthy and fun environment. You can find our all inclusive spaces at 70+ locations across the U.S. and the world. Choosing the right sport for your child can be a daunting task,. The most important thing to consider when choosing a sport is how much your child will enjoy and grow from the experience.The sports listed above are all great starts to get your child involved in an active and healthy lifestyle. Remember that ultimately, sports are meant to be a fun activity! This entry was posted in Autism Resources and tagged ASD sports, autism awareness, sports on February 14, 2019 by David TEST! Ephraim. Why You Should Book We Rock On Wheels for Your Next Event! 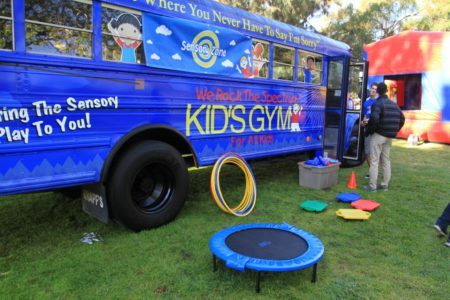 We Rock on Wheels is a mobile kid’s gym for ALL kids! We Rock on Wheels provides children of ALL abilities a place to play and grow together. 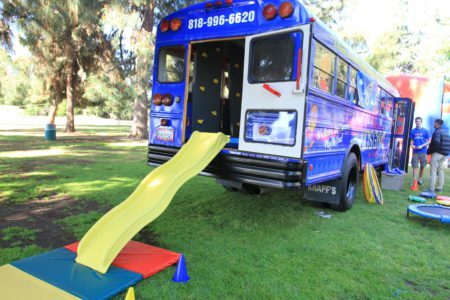 Each bus features specially-designed sensory-safe equipment that is fun to use while also helping improve areas of strength, movement, sensory processing, communication, and more! A perfect addition to any celebration you or your organization is planning to hold. In the past the bus has been booked for schools, churches, synagogues, camps, fairs, birthday parties, fundraisers, and other special events! The bus is decked out with a ROCKIN’ sound system and an air conditioner to make sure all kiddos have a blast no matter how what the weather may be! We even bring Equipment for Kiddos to Enjoy off the Bus! We give out a We Rock take home goodie bag to those who book the bus for a birthday party! The bus is geared towards younger kiddos, we recommend the max age for the bus is children in Kindergarten to Fourth grade! 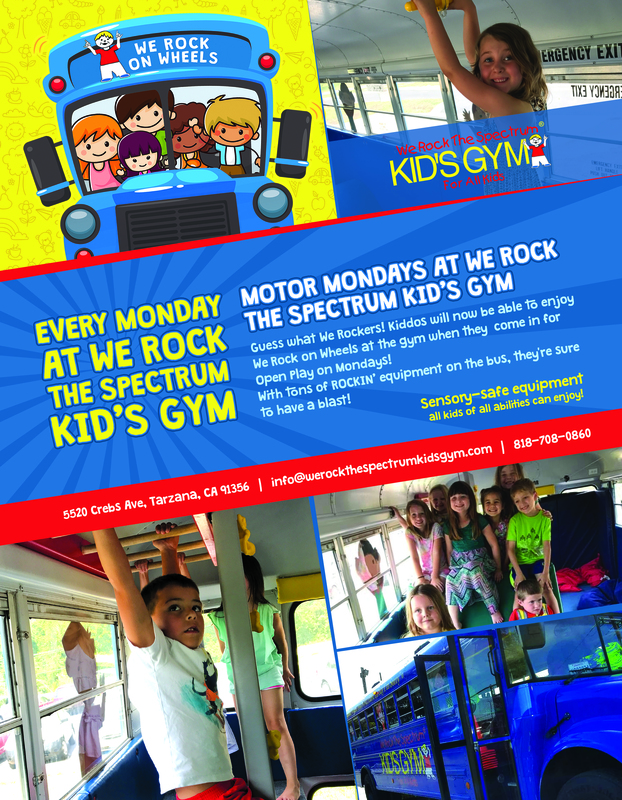 For those of you in the San Fernando Valley in California, stop by We Rock the Spectrum Kid’s Gym in Tarzana on Mondays to let your kiddos experience the bus for themselves! No extra cost, just stop by for Open Play! We Bring the Sensory Play to You! This entry was posted in Autism Resources on November 2, 2018 by David TEST! Ephraim. National Disability Employment Awareness Month: Introducing Jackie & Shawn! The next people we’d like to introduce in honor of National Disability Employment Awareness Month, are Jackie & Shawn from We Rock the Spectrum – Jacksonville! Upon arriving at the gym, both employees begin a Cleaning Task Analysis that encompasses the entire gym. This list will explain what cleaning materials to use, what materials to clean, and the cleaning tools needed. They begin at the top and work all the way to the bottom! Tasks vary from sweeping & mopping floors, sanitizing toys, wiping equipment, etc. The two boys also greet their members as they are working in the gym. Jackie has been with Jacksonville for 2 semesters now, and they have seen a significant increase in independence around the gym (grabbing supplies, task completion, transitioning between jobs) where his mentor is able to fade prompts and allow him to complete the workday on his own! 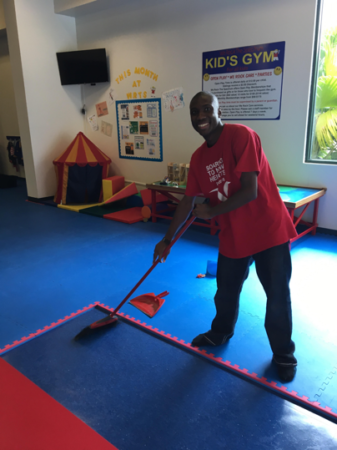 Jackie always greets everyone with a smile, is great with the members in the gym as they play, and we hear he is excited to come to work each week and be a part of the team! Keep on Rockin’ Jackie & Shawn! This entry was posted in Autism Resources, Events on October 25, 2018 by David TEST! Ephraim. National Disability Employment Awareness Month: Introducing Kelsey! 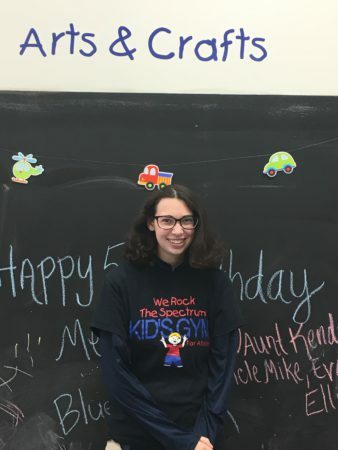 The next person we’d like to introduce in honor of National Disability Employment Awareness Month, is Kelsey from We Rock the Spectrum – Northeast Philly! Kelsey has been volunteering at the gym for one year now through a program from her school! Kelsey helps children enjoy the gym’s sensory-safe equipment! 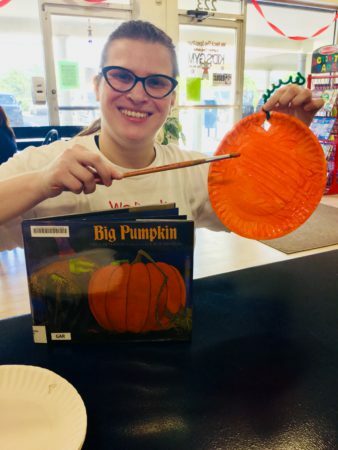 She supervises the “Make & Take Tuesday” arts and crafts projects; organizes toys and dress up clothes, organizes the rock shop and helped run the recent Summer Camp Program. Throughout the time Kelsey has been working at the gym she has gained more confidence socially. 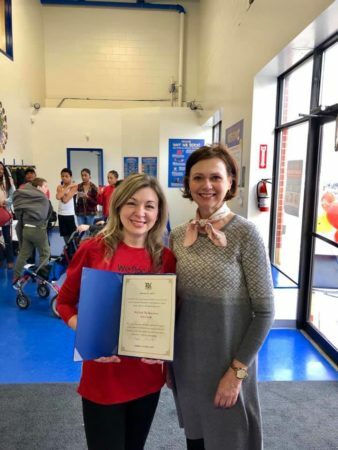 She was very quiet and hesitant to take action when she first started volunteering at the gym, however, now she talks and interacts with everyone much more naturally! 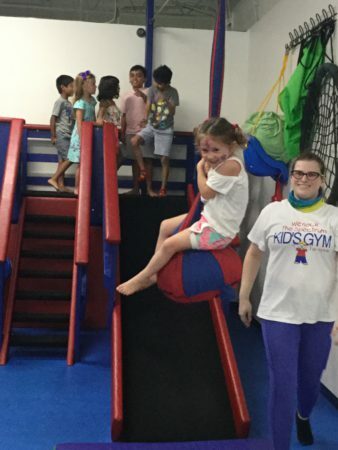 Kelsey’s favorite part of working at the gym is helping all the kiddos enjoy the equipment, especially the zip-line! Kelsey is definitely in her element helping with arts and crafts. She is very crafty. When she is working on a project with the kids she is always smiling from ear to ear! “What I like most is the opportunity to let young adults with special needs know that they are no different than any other teen or young adult, we acknowledge it and really treat them just like everyone else. It’s rewarding to see Kelsey feel so comfortable here!” – Barb Dickson, Owner of We Rock the Spectrum – Northeast Philly. This entry was posted in Autism Resources, Events on October 23, 2018 by David TEST! Ephraim. 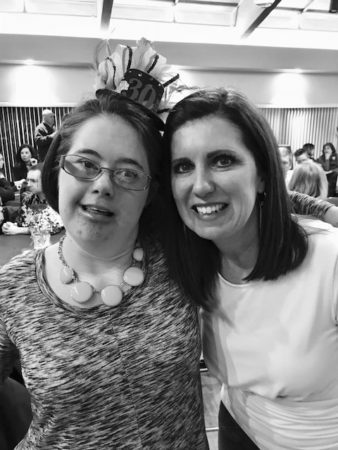 National Disability Employment Awareness Month: Introducing Megan! 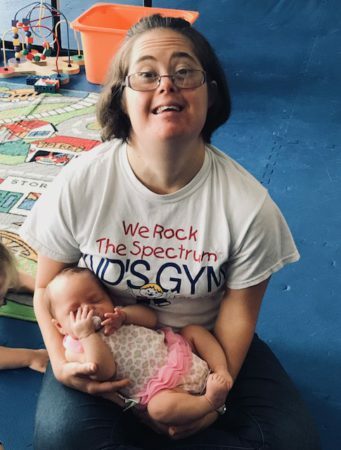 The next person we’d like to introduce in honor of National Disability Employment Awareness Month, is Megan from We Rock the Spectrum – Severna Park! Megan has been working at We Rock the Spectrum – Severna Park for about 2 years now! Megan is extremely good at her job! Her customers always appreciate the effort Megan puts in while at the gym. A typical day of work for Megan consists of her cleaning and organizing the gym. She loves assisting children on the equipment! She also takes care of administrative tasks such as filing, inventory and laminating. Her gym usually has a checklist ready for her which helps Megan know what to expect and work independently on her tasks! Throughout the time Megan has worked at the gym, she has gained confidence in her ability to work independently in the workplace! Megan loves to interact with customers (especially babies), by far it’s her favorite thing to do while working at the gym. She enjoys catching up with her coworkers. At the end of Megan’s shift, her checklist is copied, and a note is attached for her to share at home. 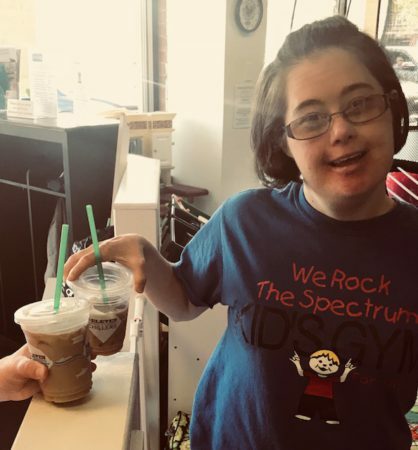 Megan loves iced coffee, We Rock the Spectrum – Severna Park utilizes a check system. Once Megan earns enough checks, she earns a complimentary iced coffee for her hard work! This is always an exciting moment as it gives Megan a visual on her progress each day! Whether the gym is packed or things are quiet, Megan works hard at getting everything on her list complete. Its clear that she takes her job very seriously. “Megan receives endless amounts of compliments on her work ethic. It is so awesome to hear and see it all. I love watching her becoming more independent!” – Courtney Cahill, Owner of We Rock the Spectrum – Severna Park. 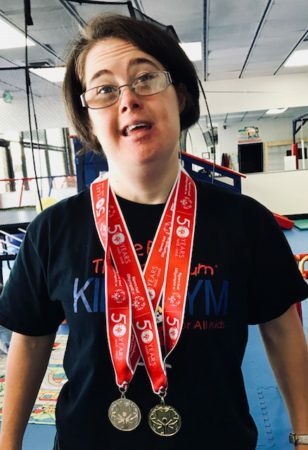 Fun Fact: Megan has won 3-4 medals in the Special Olympics in the time that she has been working at the gym! This entry was posted in Autism Resources, Events on October 19, 2018 by David TEST! Ephraim. National Disability Employment Awareness Month: Introducing Sagi! The next person we’d like to introduce in honor of National Disability Employment Awareness Month, is Sagi from We Rock the Spectrum – Jupiter/Tequesta! Sagi Brodt originally started as a volunteer at We Rock the Spectrum – Jupiter/Tequesta 18 months ago. Fast forward to today, and Sagi has worked her way up to one of Jupiter’s paid employees! Sagi’s typical work day looks no different than any of Jupiter’s other employees. She maintains safety in the gym, checks in customers, and cleans toys and equipment as needed. She recently took charge and volunteered to run Jupiter’s “Storytime” on Friday mornings! Since Sagi started working at the gym, her self-esteem and willingness to try new things has increased tremendously! She takes constructive criticism well, and has become much more flexible in her critical thinking! Sagi loves meeting new people and coming to work at the gym! Her favorite part of her workday is playing with the kids! She loves helping kiddos and getting to know her customers and their families! “There was a boy who wanted to do the zipline but was scared. She helped him realize that he could do the zip-line on his own and at his own pace. She enjoyed helping someone conquer their fears!” – Jenna Pignato, Co-owner of We Rock the Spectrum – Jupiter Tequesta. “We enjoy watching Sagi grow and learn new things! 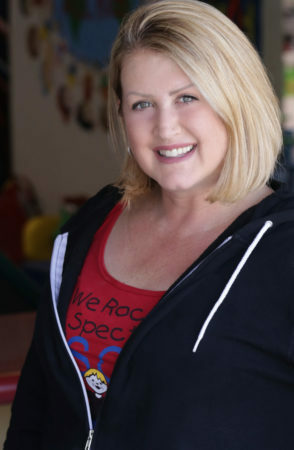 She has taught us a lot about young adults living with ASD.” – Sarah Callahan, Co-owner of We Rock the Spectrum – Jupiter Tequesta. This entry was posted in Autism Resources, Events on October 16, 2018 by David TEST! Ephraim.